(New York) "Why We Fight" is the new single from Toronto 6-piece Fast Romantics. "Why We Fight" is taken from the band’s forthcoming album (set for release in Spring, 2017). Both are released via Light Organ Records/Postwar Records. However, "Why We Fight" is not a protest song, in the traditional sense. It is perhaps best described as the reflections of a non-American songwriter living close to the border, hyper-aware of the US and its influence over Canada and the world. It's a song about being hungry for something and fighting for it through the chaos that can be beyond our control. Fast Romantics have previously released the album Afterlife Blues (2013) which received much acclaim in North America, with glowing press reviews and climbing chart positions at commercial radio. 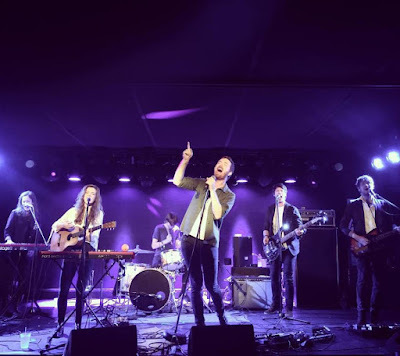 They have received many accolades including "Pop Group of the Year" at the Sirius XM Indies (2014) and more recently their song "Julia" - also taken from forthcoming third album – won the prestigious SOCAN National Songwriting Prize (2016). Why We Fight is produced by the dynamic duo of Gus Van Go and Werner F (Arkells, Wintersleep, Whitehorse). It is released digitally on 27 January. Fast Romantics forthcoming album, from which Why We Fight is taken, follows in Spring 2017. Both released via Light Organ Records/Postwar Records. Fast Romantics are Matthew Angus (lead singer, guitar), Jeffrey Lewis (bass), Kirty (vocals, acoustic guitar, synth), Kevin Black (guitars), Lisa Lorenz (keyboards) and Nick McKinlay (drums).